Pick your perfect wide receiver corps. Do you want a fleet full of 6-foot-3 destroyers? Do you make room for the small-but-speedy guys and if so how many? How about a possession guy? How about a stretch-the-field ace? Want one of each? If you don't have to go out and actually convince those guys to come to your school, if this is purely hypothetical, it's a pretty fun exercise. And in 2016, according to some statistical wide receiver archetypes from Bill Connelly of Football Study Hall, Nebraska's receivers didn't perfectly fit into any of those categories. Instead, the Huskers pass-catchers with at least 11 targets last year all fell into what Connelly termed the "Basic" category. That's not a slight, it just means none of Nebraska's receivers had a uniquely low yards per catch (possession receiver) or an especially high YPC in certain situations (play-action and go-route guys). They're mostly arbitrary definitions, but it is sort of an interesting look at Nebraska's 2016 corps. You had three of the four top receivers last season -- Jordan Westerkamp, Brandon Reilly and Alonzo Moore -- miss a combined eight games. (If you want to throw a tight end in here, Cethan Carter was NU's sixth-leading receiver while missing three games.) Continuity matters in the passing game and the Huskers didn't have a ton of it last year. Among the three senior receivers, two of them never missed the same game, but collectively their absences stretched from game one to game 13. Nebraska had Westerkamp, Reilly and Moore -- three guys who will get a crack at the NFL -- on the field at the same time in five games last year: Wyoming, Northwestern, Wisconsin, Minnesota and Maryland. Perhaps not incidentally, Nebraska's completion percentage in those five games was 58.1 percent. Its completion percentage in the other eight? Forty-five percent. To put it another way: The Huskers had 93 completions in the five games with Westerkamp, Reilly and Moore on the field together and 108 completions in the eight games with at least one of them missing. It's probably not a surprise then that Stanley Morgan Jr. led the Huskers with 65 targets. Reilly (62 targets) and Westerkamp (59) weren't far behind despite playing 10 games each. 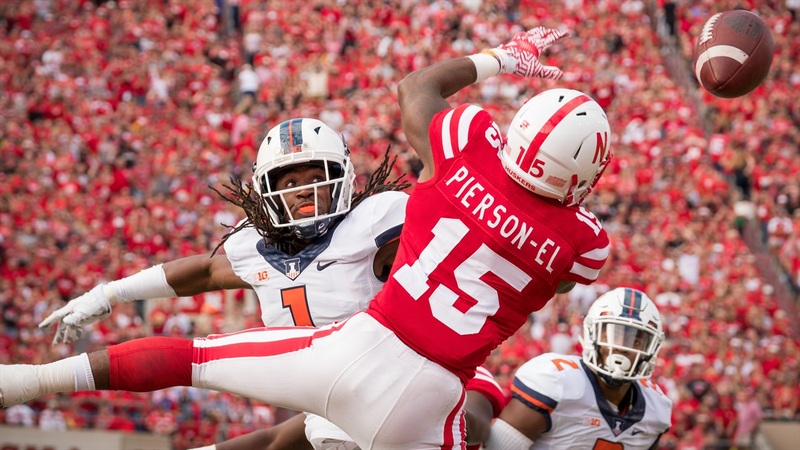 De'Mornay Pierson-El (12.7 YPC) was the closest Nebraska had to Connelly's definition of a possession guy. Reilly (19.6 YPC) nearly qualified as "Mr. Go Route." Of course, Nebraska's passing game wasn't just limited by injuries. Based on completion percentage, there was probably another ceiling to all of those numbers. If the best completion percentage possible for the Huskers in 2016 was, say, 56 percent, how do roles change if that ceiling is 62 percent in 2017? That will be interesting to watch next fall as Nebraska's receiver roles almost can't help but redefined. Don't be surprised if tight end Tyler Hoppes ends up as the Huskers' most targeted receiver. Does Bryan Reimers become Reilly 2.0 (i.e. high YPC, low catch rate)? Does Morgan become the clear leader, a la Westerkamp? It seems like Pierson-El could do a number of things, I'm just not sure which one will be his primary strength. Same with JD Spielman. It's not that those roles need to be clearly defined by a set of statistical limitations. It's more just interesting that they weren't in 2016. I wrote a little bit last week about how it seems ESPN's recent layoffs could signal the end of college football's unprecedented influx of TV money, but if you want to go deeper on that topic, here's a good read from John Talty of AL.com. There's a lot of good info here, but one item that's probably of the most local interest is this: While the Big Ten got another round of negotiations in before the merry-go-round started to slow, it will also be the first major conference back at the negotiating table. If ESPN isn't as interested or as aggressive as it has been, it lowers the demand and likely reduces the cost of the rights. That'll mean less TV money for university athletic departments to bankroll new facilities, $5 million coaching salaries and other major rising expenses. It should come as no surprise that 13 of the 20 highest-paid football coaches reside in the SEC and Big Ten, the two conferences that receive by far the most TV money. That would likely be years off, though, as the next Power 5 conference to hit the market again, the Big Ten, won't do so until 2022-23. The SEC (2033-34) and the ACC (2035-36) are locked into deals for nearly two more decades. Even if it wanted to, ESPN can't get out of those long-term contracts. The Big Ten should be an interesting bellwether for an evolving market. When it agreed to a deal in 2016, media observers believed ESPN might not bid on the rights given its shrinking distribution. ESPN ultimately decided to pay an average of $190 million annually but for a lesser package after reportedly bidding low on the initial package that went to FOX. Given the way the industry has changed so quickly, ESPN could be in a significantly different place, for better or worse, when the Big Ten's rights come up for bidding again. Talty goes on to discuss which conference might be in the best spot. It's worth your time. Cetys University, a school in Mexico, is making a bid to join the NCAA. And, yes, it has football. Nebraska ranks sixth in ESPN's Big Ten post-spring power rankings. No Big Ten teams make this list of the easiest nonconference schedules in football. Iowa, Northwestern, Nebraska: Which one is the biggest threat to Wisconsin in 2017?